So much sad news coming out of Penn State this week. So much inexcusable behavior by people in charge. So many gallons of ink printed about this, analysis and opinion. Joe Paterno's "fall" reminded me of how a number of coaches left the game. I'm sure you can think of someone. 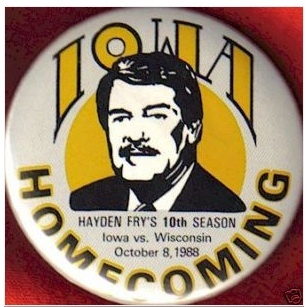 I'm going to muse on Iowa's former coach, Hayden Fry. When Fry came to Iowa, we were little more than an asterisk to the Big 10. The conference, through the 1970's, was referred to as the Big 2 and the Little 8. The winner of the Big 10 title would be either Ohio State or Michigan and that title was determined on the Saturday before Thanksgiving. That was the ONLY televised Big 10 game the networks deemed worthy of coverage. There were good games played by other schools, but, because everyone played everyone else, invariably, your team had 2 losses every year, one to Ohio State and one to Michigan. This was the era of Woody Hayes and Bo Schembeckler. Hadyen Fry took Iowa from an also ran to a powerhouse in the 1980's. We were, in 1985, ranked #1 in the nation. We crushed the opposition although we lost the Rose Bowl. Considering it had been 27 years since we'd won the Big 10 title outright, you can see how the Hawkeye faithful rallied around this coach. He was doing something we had not seen in a generation. And that's where it gets dicey. There is no way a coach with a fanatical following can ever be "down-to-earth". It's impossible. Your every move is scrutinized from the gas you put in your car to the cereal you eat for breakfast to the socks you wear on game day. We, as fans, contribute to this because we want so much to encourage and support someone who seems to bring us a glory we may not have otherwise. Gradually, it doesn't become a support of the team. We put one person, in Iowa's case, Hayden Fry, on a pedestal. He's the one who turned the program around. He's the one who recruited the players. He's the one who motivated them. He's the one who created the plays they executed. That pedestal gets taller and taller and taller. The coach can't go pump his own gas without people mobbing him at the pump, so he gets a driver and he gets security. His wife can't go grocery shopping because she's mobbed so she gets someone else to do it. The coach is in demand as a speaker. Everything he says is treated as a pearl of wisdom. Book the coach and you're assured of a sell-out for your fund-raiser. The pedestal grows ever higher. Some guys start believing their press. Some guys start distancing themselves from those they feel are beneath them. The athletic departments, mindful that football brings in millions of dollars in revenue, take a hands-off to oversight of the football program. "Coach knows what's best", they say. The pedestal grows. The thing about pedestals is that they aren't the sturdiest of things. It generally doesn't have a deep foundation. It's just a piece of, let's say, marble, sitting on a floor. They are easily tipped over because they have no anchor. In Hayden Fry's case, the 1990's chipped away at his foundation. A series of years where we were 5-6 in the conference but where we still went to the Alamo Bowl in San Antonio, caused the faithful to look at the man and not the icon. They knocked the pedestal down and realized here was a guy who was probably in need of retirement. The criticisms became pointed. The lost games scrutinized well beyond what someone else might receive. Fry retired in 1998, sort of on his own terms but most would agree he should have left about 3-5 years earlier. So, I look at the departure of Joe Paterno with the same vision I look at how Hayden Fry left. Paterno's pedestal was insanely high. In essence, he could do no wrong. His crafted image fueled the building of the pedestal and that image also contributed to its fall. It is, truly, a horrible shame that he left under these circumstances. His career will be forever linked with something sordid. The thing is, the pedestal on which he had been placed, by fans, by the university, by the media and probably, by himself, was so high his fall was bound to be tremendous. I think fans need to reassess just what they root for. When we build our support around one person, be it a player or the coach, we put them on a pedestal, a pedestal that cannot stand. The aphorism, "There is no 'i' in 'team" has been bandied about lately and, although it's quite trite, it's quite true. But we forget this. We want our teams to do well. We want that final score to be in our favor. We forget that these kinds of sports are not about one person, single-handedly winning the game. Football takes dozens of people from the 11 men on the field to their support and coaching staff. One guy's name is the head, but he can't do it without his staff and he's certainly not where he is if 22 kids don't run out onto a football field on any given Saturday in the fall and have faith that what he's telling them to do will overcome their opponent. That 'head coach' could be the guy who takes your money at the gas station without his team. I don't root for Kirk Ferenz. I root for the Iowa Hawkeyes. It won't happen, but I would like to think the Penn State scandal will cause us to look critically at the power we give these men. How high is their pedestal? Is it so high that, should they fall, they take all sorts of people with them? Can we retrain ourselves to root, not for one person but for the collective whole? I have my doubts because the personality, the charisma of one person can be overwhelming, but it's food for thought.